The Clear Quartz Flame of Saint Germain brings forth purification and energizing color rays to enhance and tittilate the energy body. 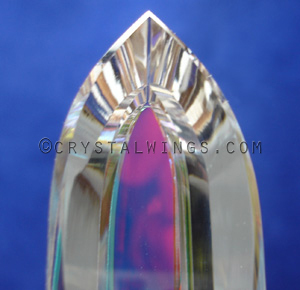 Used as a healing wand or a meditation/altar piece this crystal being becomes a joyful companion in playing in and integrating LIGHT. Sizing: 5 in. X 1-1/4 in. X 1-1/4 in.